Oh my word. How have I not had this deliciousness in my life before now?? I adore cabbage. Always have. My mom used to make me big bowls of steamed cabbage with butter and salt for lunch when I was little, and I have loved it that way ever since. If it’s not broke, don’t fix it, right?? Well, I wish I had tried this years ago, because I am absolutely hooked on this new version of my beloved cabbage! Unfortunately my sweet little nursling was not as fond of this treat as I was, so it will be a while before I will be able to make this again, but I will enjoy it oh so much when I can! 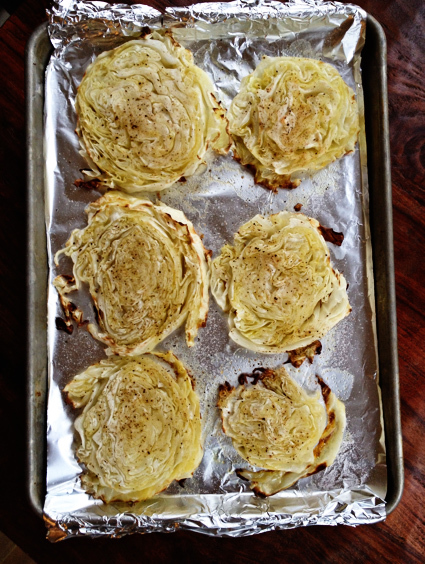 And if you think you don’t like cabbage… try this, k? You just might become a convert!! Preheat the oven to 400ºF. Line a baking sheet with foil. Remove the outer leaves of the cabbage and discard. Cut the cabbage straight down into several thick slices. Lay the slices out on the baking sheet, and then drizzle generously with olive oil and salt & pepper. Roast for about 30 minutes, until the cabbage is starting to brown. Serve immediately, with more salt & pepper to taste!